Unless you’ve been living under a rock, surely you’ve seen the recent viral video showing an Australian surfer’s miraculous escape from a great white shark during a tournament, the creature’s fins thrashing wildly in the water before the surfer swam to the safety of a jet ski. 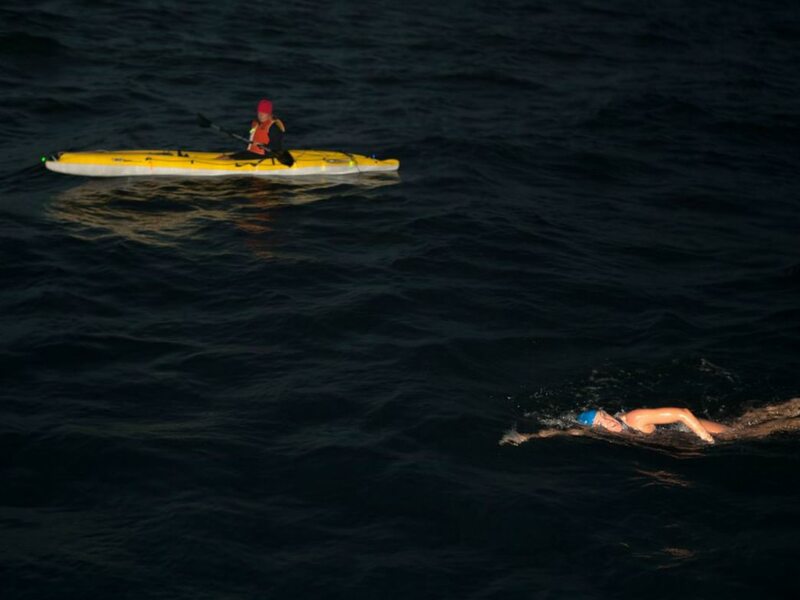 Watching the jaw-dropping footage, it’s hard to fathom what two Bay Area swimmers have in their sights: a 28-mile swim from the Golden Gate Bridge to the Farallon Islands, home to one of the world’s largest great white shark populations. Between July 27 and July 30, Simon Dominguez, an Australian native now based in Corte Madera, will attempt to become the first person to complete the swim from the bridge to the islands, also known ominously as The Devil’s Teeth for the shipwrecks they caused to ancient vessels. Around two weeks later, Dominguez's training partner, native New Zealander Kim Chambers, who now lives in San Francisco, will aim to become the first woman to do it (although she may reverse the route, depending on tides and weather conditions). But the possible presence of toothy predators is just one of the obstacles facing the pair. 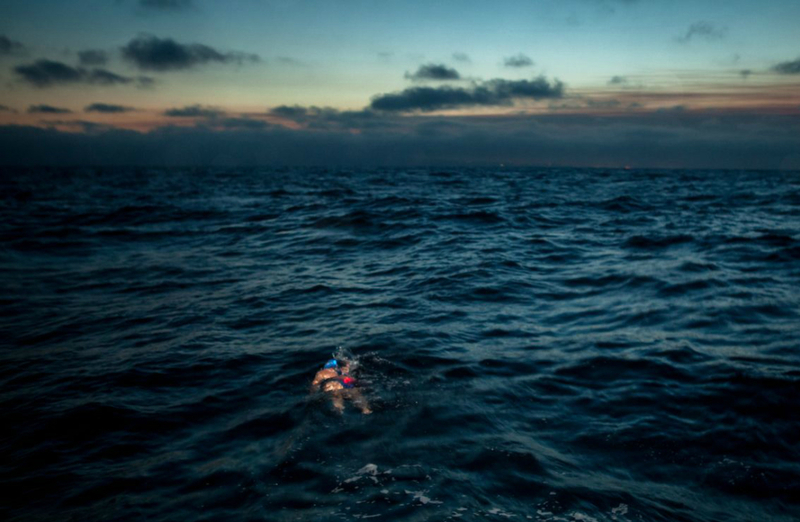 They’ll also have to contend with the notorious conditions of San Francisco Bay and the Pacific Ocean—strong currents, large swells, stiff winds, and water temperatures hovering between 55-60 degrees—not to mention the mental and physical exhaustion of 14-plus hours of strenuous, open water swimming. Oh, and all that without a wetsuit: The rules that govern open-water swims all over the world only allow swimmers to wear a swimsuit, pair of goggles, and swim cap. Both Dominguez’s and Chambers’ expeditions are being organized in conjunction with Night Train Swimmers , a Bay Area group that raises money for charity through long-distance swims. Crew members dedicated to shark spotting will be aboard the boat that will follow alongside them; if one is seen, the swimmer will get into the boat. 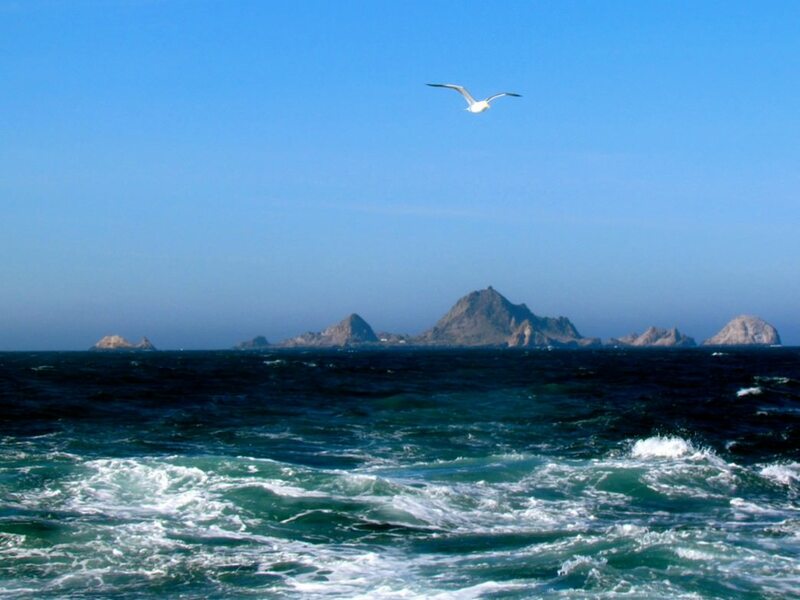 But, according to the regulations of the Farallon Islands Swimming Federation regarding open water swims, he or she will have 10 minutes to decide whether to continue the swim—a rule that applies to only one other swim in the world, the Cook Strait in New Zealand. Both swimmers' historic attempts are also being documented by film crews. Filmmaker Jack Bushell, who also lives in Marin County, has been rolling the cameras throughout Dominguez’s training regimen gathering footage for an approximately 30-minute documentary about his quest. On the actual expedition, Bushell plans to use equipment including a drone and waterproof GoPro camera as Dominguez makes his way across the ocean. Over the past several months, Dominguez and Chambers have been putting in multi-hour training swims around the bay. One started at 10 pm and finished around 6 am, though Dominguez notes it’s harder to find kayaking support for such night-owl excursions. Another essential part of training for marathon swimmers is putting on weight—a notion that can seem counterintuitive. But that added weight helps with buoyancy and insulation when you’re spending extended time (and burning massive amounts of calories) in chilly water. You also need to be in incredible physical shape. 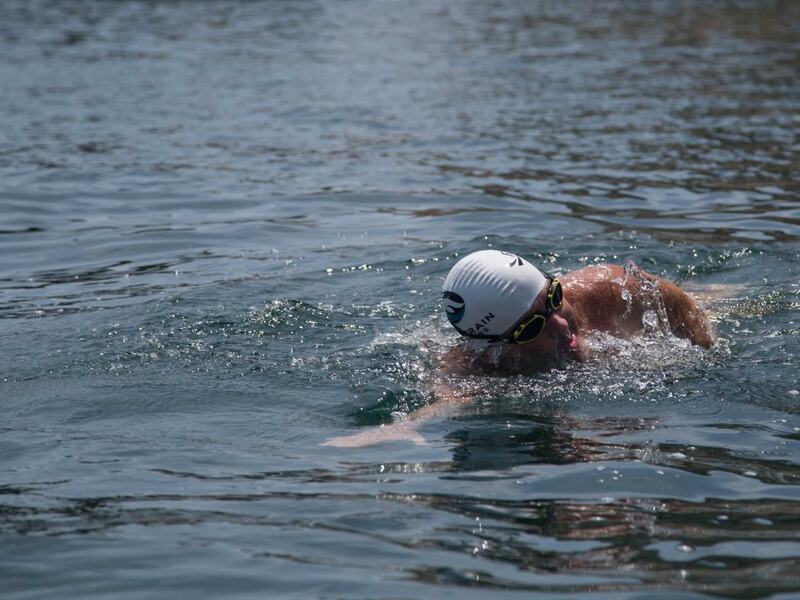 Both Dominguez and Chambers have already notched impressive open-water feats: Since he started long-distance swimming just five years ago, Dominguez has swum the English Channel in grueling conditions, and last summer, he made his way across the 22-mile length of Lake Tahoe. A former ballerina and rower at Cal-Berkeley, Chambers took up swimming as a way to recuperate from a devastating leg injury, which required her to re-learn how to walk. 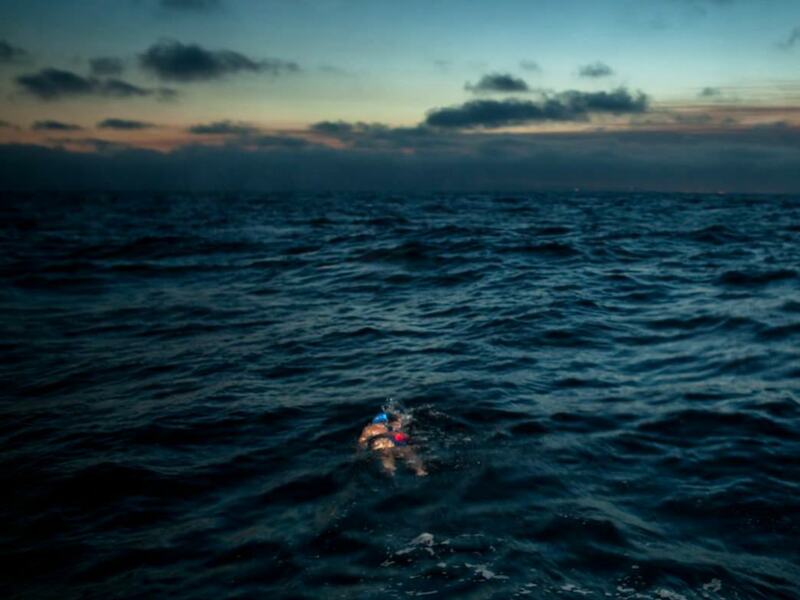 Since starting to swim competitively in 2011, she has since completed the seven most difficult swims in the world, becoming just the sixth person to do so.